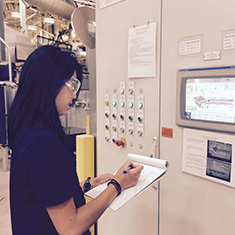 Amy Chiang investigated efficiency savings General Motors could achieve in its aluminum foundries. In the summer of 2015, when Amy Chiang was hired as an EDF Climate Corps fellow at General Motors (GM), the GM Global Facilities group had a goal to drive a 20 percent reduction in energy use by 2020. Since foundries, where parts are cast, are one of the largest energy users in the manufacturing process, GM hired Amy Chiang to build a matrix to compare the GM aluminum foundries to determine which foundries had the highest potential energy savings and guide decision making related to new product development. When she started building the model, Chiang spent the majority of her time collecting the data from all the U.S. GM foundry sites and engaging with industry experts internal and external to GM. Through this, she learned about how the aluminum casting process works, where energy is used in a foundry, what data was available and what information could easily be obtained. Additionally, she gained insight to the future of energy use in foundries. In addition to building the model and collecting data, Chiang also participated in two EPA Energy Treasure Hunts to do a deep dive on potential energy savings at a foundry site and an assembly/powertrain facility. During the foundry treasure hunt, she was able to do an in-depth analysis of switching a furnace from running “batch production” to “continuous production.” This reduces downtime and inefficiencies and could lead to up to $1.2 million in energy and metal savings. GM began implementing the suggested change before her fellowship concluded. Based on Chiang’s model, a comparison between the current foundries and a theoretically designed foundry would result in annual energy savings of over $800,000 dollars. This would be from a reduction in almost 90,000 therms of natural gas, 500 metric tons of carbon dioxide emissions and over 370 short tons of aluminum annually. Amy Chiang is a dual-degree MS/MSE candidate at the University of Michigan. After learning about the significant impact companies have on sustainability, she became passionate about sustainability in the corporate space and hopes to become a consultant. Chiang enjoys spending time outdoors playing Ultimate Frisbee.